A satisfying conclusion to an excellent trilogy, The Bourne Ultimatum is an exciting, intelligent and impeccably directed thriller. Picking up immediately where The Bourne Supremacy left off, the third part of the Bourne trilogy sees Jason Bourne (Matt Damon) closing in on the shadowy Treadstone group that turned him into a trained killer. He gets a sizeable clue from a Guardian journalist (Paddy Considine) but Treadstone are rapidly covering their tracks and sending various hitmen after him. The trail then leads to Madrid, where Bourne meets up with Nicky Parsons (Julia Stiles), his former handler, before hot-footing it to Tangier for another round of bullet-dodging. Meanwhile, CIA investigator Pamela Landy (Joan Allen) begins to suspect that her bosses (David Strathairn and Scott Glenn) know more about Treadstone than they're letting on. 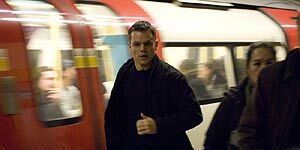 Damon is terrific as Bourne, driven by an all-consuming need to find out who he is, no matter what the cost. There's an intensity to his performance that marks him out from the usual wise-cracking action heroes, even if he does seem more indestructible than three John McClanes. The supporting cast are equally good, particularly Stiles, whose character is finally expanded beyond the glorified cameos of the previous films. Allen is excellent as always and there's good work from Strathairn and Glenn, as well as a and a cameo by Albert Finney. It's just a shame Considine disappears so soon. Supremacy director Paul Greengrass is back on board for the third instalment and he orchestrates some breath-taking action sequences, notably a bone-crunching close quarters fight to the death in a Tangier apartment block and a thrilling bike chase. He's also perfected his approach to the fight scenes themselves, using handheld cameras and rapid editing to achieve chaotic but effective sequences that would seem incoherent if directed by anyone else. In short, The Bourne Ultimatum is an exciting, suspenseful and intelligent action thriller that's easily the best of the summer blockbusters. Highly recommended.